DefCon One! Twenty megatons of horror charge across the sky. What will you do? Fast bombers poised like daggers at the enemy's throat epitomized the Cold War air threat. Interceptors built to face this menace still form the backbone of may of the worlds air forces. So great was the tension that the United States Strategic Air Command kept several flights of thermonuclear-armoured bombers continuously aloft for nearly a decade. This 24-hour-a-day sentinel force was called Airborne Alert! Birds of Prey - Airborne Alert expands the revolutionary game of jet dogfights, adding the bombers and interceptors that defend the Cold War, and a set of aggressors for air combat training. Exciting new scenarios pit these powerful aircraft in close-combat duels, where cunning tactics and skilful maneuvering are the keys to victory. Look down the barrels of a bomber's tail guns, wield missile and cannon to bring the behemoth down in flames, all played with the detail and aerodynamic fidelity unique to the Birds of Prey system. 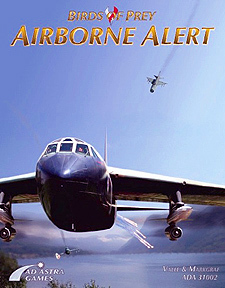 Birds of Prey - Airborne Alert contains lavishly illustrated data cards for some of the most famous fighters, bombers, and missiles of the Cold War. Detailed 1:950th - scale box-miniatures are provided for each aircraft, as well as adding swing-wing positions and new markings for aircraft from Birds of Prey - Air Combat in the Jet Age. Seventeen new scenarios are included, each with a map for easy set up, a detailed background and stores charts for each aircraft. Birds of Prey - Air Combat in the Jet Age is required for play.